Martha and the Vandellas in 1965. (L-to-R) Rosaland Ashford, Martha Reeves, and Betty Kelley. The group's string of hits included "Come and Get These Memories", "Heat Wave", "Quicksand", "Nowhere to Run", "Jimmy Mack", "Bless You" and "Dancing in the Street", the latter song becoming their signature single. During their nine-year run on the charts from 1963 to 1972, Martha and the Vandellas charted over twenty-six hits and recorded in the styles of doo-wop, R&B, pop, blues, rock and roll and soul. Ten Vandellas songs reached the top ten of the Billboard R&B singles chart, including two R&B number ones, and six Top Ten Pop Hits on the Billboard Hot 100. Teenagers Rosalind Ashford and Annette Beard first became acquainted after a local music manager hired them to be members of a girl group he named The Del-Phis. Ashford & Beard, along with then-lead vocalist Gloria Williams, performed at local clubs, private events, church benefits, YMCA events and school functions. They were also being coached by Maxine Powell at Detroit's Ferris Center. One of the group's first professional engagements was singing background for singer Mike Hanks. The group originally had up to six members, shortened to four. After another member left the group, she was replaced by Alabama-born vocalist Martha Reeves, who had been a member of a rival group, the Fascinations, and had also been a member of another group, the Sabre-Ettes. In 1960, the group signed their first recording contract with Checker Records, releasing the Reeves-led "I'll Let You Know". The record flopped. The group then recorded for Checkmate Records, a subsidiary of Chess Records, recording their first take of "There He Is (At My Door)". That record, featuring Williams on lead vocals, also flopped. Briefly separated, Reeves returned to a solo career performing under the name Martha LaVaille, in hopes of getting a contract with emerging Detroit label Motown. After Motown staffer Mickey Stevenson noticed Reeves singing at a prominent Detroit club, he offered her his business card for an audition. Reeves showed up at Motown on a wrong date (Motown auditions were held at Thursdays, while Reeves showed up to Motown's Hitsville USA studios on a Tuesday). Stevenson, initially upset, told Reeves to look out for clients and other matters. Soon Reeves became Stevenson's secretary and later was responsible for helping acts audition for the label. By 1961, the group, now known as The Vels, were recording background vocals for Motown acts. Prior to her success as lead singer of The Elgins, Sandra Edwards (then going by her surname Maulett) recorded the song "Camel Walk", in 1962, which featured the Vels in background vocals. That year, the quartet began applying background vocals for emerging Motown star Marvin Gaye, singing on Gaye's first hit single, "Stubborn Kind of Fellow" After Mary Wells failed to make a scheduled recording session feigning a short illness, the Vels recorded what was initially a demo recording of "I'll Have to Let Him Go". Motown was so impressed by the group's vocals – and Martha's lead vocals in the song – that the label CEO Berry Gordy offered to give the group a contract. Figuring that being in show business was too rigorous, Williams opted out of the group. With Williams out, the remaining trio of Ashford, Beard and Reeves renamed themselves The Vandellas, after Detroit's Van Dyke Street and Reeves' favorite singer, Della Reese. The group's success continued with their second Top Ten single and third Top 40 single, "Quicksand", which was another composition with Holland-Dozier-Holland and reached number eight pop in the late fall of 1963. Around that time, Annette, who was pregnant with her first child and set to get married, chose to leave her singing career behind by 1964. Betty Kelley, formerly of the Velvelettes, was brought in shortly afterward to continue the Vandellas' rise. The next two singles, "Live Wire" and "In My Lonely Room" (#6 R&B Cashbox) were less successful singles, failing to reach the Pop Top 40. However, their next single, "Dancing in the Street", rose up to #2 on the Billboard Hot 100 and also found global success, peaking at #21 on the UK Singles Chart in 1964. In 1969, "Dancing in the Street" was re-issued and it was plugged heavily on radio stations. It did not take long for the song to peak at #4 in the UK, thus making the song one of the all-time favourite Motown single releases ever. The song became a million-seller, and one of the most played singles in history. Between 1964 and 1967, singles like "Wild One" (US #34), "Nowhere to Run" (US #8; UK #26), "Love (Makes Me Do Foolish Things)" (US #70; R&B #22), "You've Been in Love Too Long" (US #36), "My Baby Loves Me" (US #22; R&B #3), "I'm Ready for Love" (US #9; R&B #2; UK #29) and "Jimmy Mack" (US #10; R&B #1; UK #21) kept the Vandellas on the map as one of the label's top acts. The Vandellas' popularity helped the group get spots on The Ed Sullivan Show, The Mike Douglas Show, American Bandstand and Shindig!. Throughout this period, the Vandellas had also become one of the label's most popular performing acts. On June 28, 1965 the group appeared with several other popular acts of the period on CBS-TV's Murray The K-It's What's Happening, Baby. Martha, Rosalind and Betty performed "Nowhere to Run," as they skipped through a Ford auto plant and sat in a Ford Mustang convertible as it's being assembled. Motown struggled to find good material for many of their acts after the exit of Motown contributor and Reeves' mentor William "Mickey" Stevenson in 1967 and Holland–Dozier–Holland in early 1968, but after their former collaborators left the label, the Vandellas initially continued to find success with the Richard Morris-produced singles "Love Bug Leave My Heart Alone" (US #25; R&B #14) and "Honey Chile" (US #11; UK #30; R&B #5) added to their already extended list of charted singles. In the summer of 1968, the group joined The Supremes, The Temptations, The Four Tops and Marvin Gaye in performing at the Copacabana though much like albums from the Four Tops and Gaye, a live album of their performance there was shelved indefinitely. That same year, label changes had started to take effect, and Gordy focused much of his attention on building the Supremes' as well as Diana Ross' burgeoning upcoming solo career that would follow in 1970. The Vandellas' chart performance (and the chart performance of many Motown acts with the exception of Marvin Gaye, The Temptations, and Stevie Wonder) suffered as a result. However it was the infighting among the members of the Vandellas that led to their problems. Kelley was the first to be let go after reportedly missing shows, as well as getting into altercations with Reeves. There were many instances where these "fights" happened on stage. Kelley was fired in 1967 and was replaced by Martha Reeves' sister Lois. Simultaneously, the group's name was officially changed to Martha Reeves and the Vandellas, to conform with the company's recent changes of The Supremes' and The Miracles' names to reflect their featured lead singers. During this time, Vandellas records including "(We've Got) Honey Love", "Sweet Darlin'" and "Taking My Love and Leaving Me" were issued as singles with diminishing success. Reeves, out of the group temporarily due to illness, recovered and returned; Ashford was replaced by another former member of the Velvelettes, Sandra Tilley, and the group continued to release albums and singles into the early 1970s. Although they could not reignite the fire they had made in America they continued to have successful records the UK and abroad. Among their late 1960s hits was "I Can't Dance to That Music You're Playing", which featured singer Syreeta Wright singing the chorus, and peaked at number forty-two. Reeves reportedly hated singing the song sensing it "close to home". In 1969 a reissue of "Nowhere To Run" reached the top 40 in the UK. In 1970, the group issued Motown's first protest single, the controversial anti-war song, "I Should Be Proud", which peaked at a modest forty-five on the R&B singles chart. The song was uncharacteristic of the Vandellas and did nothing to promote the group. On some stations, the flip-side "Love, Guess Who" was played instead,however the group reached the top 20 that year in the UK with a reissue of "Jimmy Mack". In 1971, the group scored a top 11 hit in the UK with "Forget Me Not". later that year they scored an international hit with "Bless You" (produced by the Jackson 5's producers The Corporation). The song peaked at number fifty-three on the American pop singles chart (the biggest peak of Vandellas' seventies singles in the US), and number twenty-nine on the R&B singles chart. "Bless You" reached number thirty-three in the UK giving the group two big hits that year in England. . "Bless You" reached number 16 in Canada and went all the way to number 2 in Puerto Rico . It was to be the last Billboard Hot 100 hit single for the group. After two successive Top 40 R&B singles, the ballad "In and Out of My Life" (#22 US R&B) and the Marvin Gaye cover, "Tear It On Down" (#37 US R&B), the group disbanded following a farewell concert, held at Detroit's Cobo Hall on December 21, 1972, but Martha Reeves is still often billed as ‘Martha Reeves& The Vandellas’. The next year, Reeves announced plans of starting a solo career. At the same time, Motown Records moved its operations to Los Angeles. When Reeves did not want to move, she negotiated out of her contract with Motown, signing with MCA in 1974, and releasing the critically acclaimed self-titled debut album, Martha Reeves. Despite rave reviews of her work, neither of Reeves' post-Vandellas/Motown recordings produced the same success as they had the decade before. After living what she called "a rock & roll lifestyle" of prescription pills, cocaine and alcohol, Reeves sobered up in 1977, overcoming her addictions and becoming a born-again Christian. After the Vandellas' split, Reeves' sister Lois sang with the group Quiet Elegance and sang background for Al Green, while Tilley retired from show business in the late 1970s, suddenly dying of a brain aneurysm in 1981 at the age of thirty-eight. Original member Gloria Williams, who retired from show business when she left the group, died in 2000. In 1978, Reeves and original Vandellas Ashford and Beard reunited at a Los Angeles benefit concert for actor Will Geer. In 1983, Reeves successfully sued for royalties from her Motown hits and the label agreed to have the songs credited as Martha Reeves and the Vandellas from then on. That year, Reeves performed solo at Motown 25, which alongside some of their songs being placed on the Big Chill soundtrack, helped Reeves and the Vandellas gain a new audience. In 1989, original members Ashford and Beard also sued Motown for royalties. During this time, the original trio were inspired to reunite both as a recording act and in performances. They were offered a recording contract with Ian Levine at Motorcity Records who issued the group's first single since the Vandellas disbanded seventeen years earlier called "Step Into My Shoes." Although they are no longer singing together full-time, Martha Reeves and the Vandellas have occasionally reunited for various concerts. Currently, Ashford, whose full name now is Rosalind Ashford-Holmes, and Beard, whose full name now is Annette Beard-Helton, continue to perform with other singers, most notably Roschelle Laughhunn, as "The Original Vandellas." 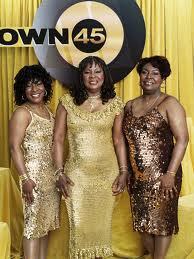 Reeves, with her sisters Lois and Delphine Reeves, tour as "Martha Reeves and the Vandellas." From 2005 to 2009, Reeves held the eighth seat of Detroit's city council. She has since lost her seat and told the press that she would continue performing. A remake of the song "Nowhere To Run," sung by Arnold McCuller, is heard in the film "The Warriors" during the scene in which the Gramercy Riffs call a hit on the Warriors. In a Season One episode of the television show The Golden Girls, Blanche describes her car as the "noisiest thing to come out of Detroit since Martha & The Vandellas.". Candice Bergen, who hosted the Saturday Night Live episode on which Martha Reeves appeared in its inaugural season, made sure that Martha Reeves and the Vandellas were a presence throughout her "Murphy Brown" series. The group's picture was displayed prominently in Murphy's office. When Aretha Franklin guest starred and Murphy tried to sing with her, Franklin stopped her, saying, ". . .I'm not Martha, and you ain't no Vandella." They won a Grammy in 1999, (they were nominated for Best R&B Vocal Performance by a Duo or Group for "(Love Is Like A) Heat Wave", in 1964), Martha and the Vandellas' "Dancing in the Street" was inducted to the Grammy Hall of Fame in 1999. In 1993, Martha Reeves and the Vandellas were awarded the Pioneer Award by the Rhythm & Blues Foundation. Except for pre-Vandellas member Gloria Williamson and Vandellas member Sandra Tilley, all members of the group were inducted to the Rock & Roll Hall of Fame in 1995, becoming the second all-female group to be inducted. They were inducted by rock group The B-52's, whose frothy dance music was inspired by the Vandellas. They were inducted into the Vocal Group Hall of Fame in 2003. Two of their singles, "(Love Is Like a) Heat Wave" and "Dancing in the Street" were included in the list of The Rock and Roll Hall of Fame's 500 Songs that Shaped Rock and Roll. In 2004, Rolling Stone ranked the group #96 on their list of the 100 Greatest Artists of All Time. In 2005, Martha & The Vandellas were voted into the Michigan Rock and Roll Legends Hall of Fame. Always concert favorites, Martha Reeves and the Vandellas were nominated for UK Festival Awards in 2010 and 2011 as "Best Headliner." Regarded for their early and mid-1960s work, some of the Vandellas' popular recordings have become part of American culture with their 1964 standard, "Dancing in the Street," being the obvious example. One of the most covered and popular songs in rock and roll history, "Dancing in the Street" was covered several times including a 1982 live recording by rock band Van Halen and a 1985 duet by rockers David Bowie and Mick Jagger. "Dancing in the Street" is considered[who? ]to be the "Motown Anthem" by many. Martha and the Vandellas 1963 hit, "(Love Is Like a) Heat Wave," was the first song that signified the Motown sound or the "Sound of Young America" with its backbeat and bouncing rhythms. 1965's "Nowhere to Run" has been featured during sports events. 1967's "Jimmy Mack" inspired what Reeves later said was a "virtual legend" of the name of the song "Jimmy Mack." Martha Reeves and the Vandellas' "(Love Is Like a) Heat Wave" and "Dancing in the Street" were inducted to the Grammy Hall of Fame and were both included in the list of The Rock and Roll Hall of Fame's 500 Songs that Shaped Rock and Roll. They were inducted to the Rock & Roll Hall of Fame in 1995 becoming just the second all-female group to be inducted and the fifth group in the Motown roster to be inducted. They were inducted to the Vocal Group Hall of Fame in 2003. They were nominated for a Grammy Award for Grammy Award for Best R&B Performance in 1964 for their hit song "Heat Wave"
"Dancing in the Street" was included in the United States Library of Congress' National Recording Registry for its historical, artistic and cultural significance in 2006. ^ a b "The Original Vandellas". ^ "Martha and the Vandellas Biography". Britannica.com. Retrieved 16 December 2010. ^ "Martha Reeves". TheSoulGuy.com. Archived from the original on 2008-05-10. Retrieved 16 December 2010. ^ a b c d e f g "Martha and the Vandellas". HistoryofRock.com. Retrieved 16 December 2010. ^ "Martha Reeves". General Entertainment.com. Archived from the original on 24 February 2011. Retrieved 16 December 2010. ^ a b Martha and the Vandellas. Ebony. February 1968. Retrieved 16 December 2010. ^ Warner, Jay, ed. (2006). American Singing Groups: A History, From 1940 to Today. Hal Leonard. p. 584. ISBN 0-634-09978-7. Retrieved 16 December 2010. ^ Martha Reeves Without the Vandellas. Ebony. February 1988. Retrieved 16 December 2010. ^ Gaar, Gillian G., ed. (2002). She's a Rebel: The History of Women in Rock and Roll (Live Girls). Seal Press. p. 496. ISBN 1-58005-078-6. Retrieved 16 December 2010. ^ Martha Reeves Quits Vandellas To Go Solo. Jet. 15 February 1973. Retrieved 16 December 2010. ^ Singer Martha Reeves Leaves Motown Records. Jet. 29 March 1973. Retrieved 16 December 2010. ^ "Martha Reeves". Encyclopedia.com. Retrieved 16 December 2010. ^ "Motown 25:Yesterday, Today, Forever". IMDB. Retrieved 16 December 2010. ^ a b Kroll, Vicki L. (31 August 2010). "Motown Legend to sing at Music Fest". University of Toledo. Archived from the original on 8 October 2010. Retrieved 16 December 2010. ^ Al Green, Martha and the Vandellas Inducted Into Rock and Roll Hall of Fame During Gala Ceremonies in New York City. Jet. 30 January 1995. Retrieved 16 December 2010. ^ Advertising, OJ. "Michigan Rock and Roll Legends - MARTHA & THE VANDELLAS". www.michiganrockandrolllegends.com. Martha & The Vandellas bio on the Soulwalking U.K. website.